This is very interesting and mind twisting logic Math Problem for adults. In this logical puzzle, looking at first three logical statements, one will be able to find the logical pattern in these equations. However when one comes across the 4th logical statement or logical equation, then the previous thought logic fails. Lets see if you are able to find this logical pattern in your first try and solve this Logic Math Problem? Can you solve this Logic Math Problem? 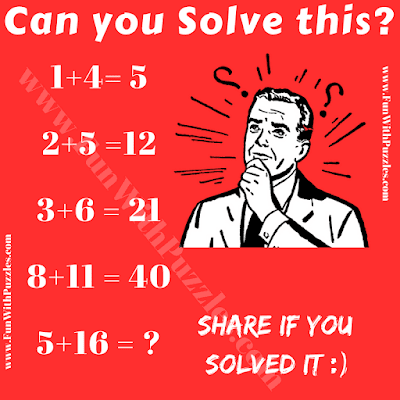 Answer of this "Logic Math Problems for Adults", can be viewed by clicking on button. Please do give your best try before looking at the answer.